Are you getting ready to look for and order invitations for your wedding? There are so many choices these days. Not so long ago the only choice was an ivory or white paper, folded, with the writing in black engraving or thermography. We have surely come a long way from that. Ever popular is the pocket invitation. The pocket either holds all the accessory cards or the invitation itself and the accessory cards. Brides are using this type of invitation because they express their style. Color combinations are almost unlimited. We do custom invitations at Events by Design so the design can be anything we can dream up. Some brides even draw something to be included – like a charming map. Instead of lots of little cards stuffed in an envelope, we recommend using a Guest Information Card. If it is a little larger it will fit into the pocket or envelope, but not be so little that it gets lost in the shuffle. I like to put the hotel information, directions, parking arrangements or complimentary shuttle times, and even the reception information on this card. If you are doing a custom map that might also be printed on the reverse side. Color is huge in contemporary invitations. 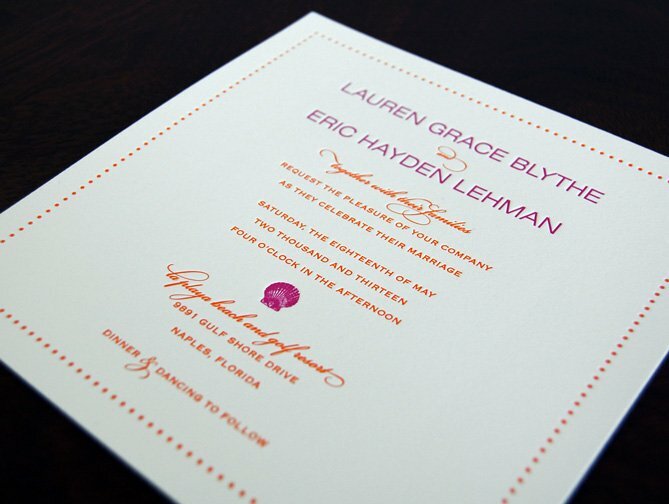 Use it on the envelope liner, the invitation itself with some restraint, or even layers along with the printed piece. With imagination and the help of a stationer specializing in wedding invitations, you will be able to have a unique invitation that you will be proud to send and that will become a treasured keepsake. This invitation has layers, color, and is assembled into a pocket fold. The guest information card is in the pocket.